The issues raised in this seminar will concern the choice of languages, symbols and other signs and rituals of exchange and communication. On the basis of two current research projects on the coexistence of signs, and taking account of the contemporary media, the seminar will look at ways of experiencing and promoting internationality in today’s world. The UN, for instance, has six official languages; but these account for just 40% of the world’s population, disregarding (to mention just some of the most widely used ones) Hindi, Bengali and Portuguese. At the same time, half of the 6000 languages still spoken in the world are threatened with short-term extinction. The international organizations are torn between efficiency and a wish to cultivate, experience, represent and protect the world’s cultural diversity. This raises the question of how these organizations are perceived through their communication, and what their symbolic value is. 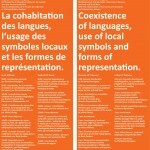 Graphic design and the ability to convey multiplicity will be key themes in this seminar.